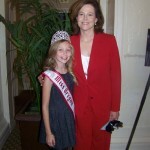 Oregon Pre-Teen Queen, Madeline Monlux, working hard to shed light on gorilla conservation. At age 11, Madeline Monlux who won her title in May has been working diligently to raise money for the Dian Fossey Gorilla Fund, an organization close to Madeline’s heart, as she would like to become a primatologist and follow in the footsteps of her idol, the late Dian Fossey. She loves mountain gorillas and recently raised over $1000 to bring awareness and shed light on gorilla conservation. 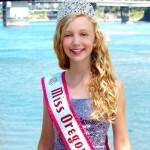 Helping her shed that light might just be the sparkling crown and sash she wears as Miss Oregon Pre Teen. No stranger to volunteering, Madeline has given her time every weekend since June to a variety of charitable events and organizations. As Miss Oregon Pre Teen, Madeline has traveled throughout the state as an ambassador for Oregon, as well as speaking about her passion, the mountain gorillas. 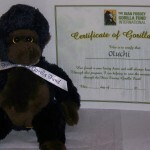 Madeline came up with an idea to sell stuffed gorillas complete with special certificates, with all of the proceeds benefiting the Fossey fund. She partnered with the Fossey fund and TY (the beanie baby company) and the results were astonishing. Madeline named each gorilla individually after African namesakes meaning love, peace and other positive messages. She then tied a special bow on each gorilla and then it was time to get to work selling the gorillas. “People wanted to buy the gorillas before they were even available”, says Monlux referring to an announcement made on social media site, Facebook. “My friends and family, pageant people and people from all over supported this project. I have sold almost 100 gorillas and raised over $1000 for the Dian Fossey Gorilla Fund,” exclaims a proud Monlux. In early October, Madeline was invited as a special guest to the Dian Fossey Circle Luncheon in New York, where she had the opportunity to meet with her favorite actress, Sigourney Weaver, who portrayed Dian Fossey in the film, “Gorillas in the Mist”, talk with primatologists from Africa who work with the mountain gorillas and present a check to the organization’s CEO. A dream come true for a young woman who simply wants to help protect her gorilla friends. Madeline had the most amazing time and has been offered so many wonderful opportunities from people she met there. They all loved her and she was even asked to be an honorary board member of the foundation. She has been invited to speak at an upcoming event at Pebble Beach, California and was also invited for a private tour of the gorilla habitat at the Atlanta Zoo. Author Matt LevertonPosted on October 12, 2011 Categories oregon, pictures, Press Release, RoyaltyTags american, conservation, gorilla, madeline, miss, monlux, nam, namiss, national, oregon, pageant, pageants, pre, queen, teenLeave a comment on Oregon Pre-Teen Queen, Madeline Monlux, working hard to shed light on gorilla conservation.